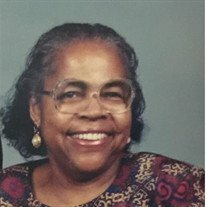 Obituary for Florinda J. Cephas | E.F. Boyd & Son, Inc.
On September 9, 1923, a beautiful baby girl was born by the name of Florinda Janet Wongus to David and Amy Woolford Wongus. Florinda was the last survivor of their eight children. She was educated in the schools of Dorchester County and graduated from Frederick Douglas St. Clair High School in Cambridge, Maryland, in 1940 at age 16 as the school system then only went to the 11th grade. Affectionately known as "Flo" or "Flo-Flo" to her family and friends, Florinda was born in Trippe Neck, Maryland, near Cambridge, Maryland, to the late David and Amy Woolford Wongus. She moved to Baltimore, Maryland where she worked several years before marrying Junior Purnell Cephas, also from her high school. She joined him in Lima, Ohio where he worked for Ford Motor Company. Florinda was a housewife for years and worked as a domestic. They eventually moved to Findlay, Ohio, where she enjoyed working at Winebrenner Village. Florinda and Junior celebrated fifty-one years of marriage before his death in January, 2004. They were blessed with six children between the two of them, and reared two grandchildren to adulthood. Junior and Florinda were always thankful for the accomplishments of their children and grandchildren. Florinda and Junior annually shared their family roots with yearly vacations to Maryland and hosting their families when they visited them in Ohio. Florinda was reared in a Christian home. She accepted Christ early on, and lived her life as a devoted and faithful Christian. She was raised up in the church and her faith in God never wavered. While living in Lima, Ohio, Florinda joined St. Paul A.M.E. Church and was a member of the Missionary Society. After moving to Shaker Heights, Ohio where she and Junior spent their retirement years, she became a member of St. Paul United Methodist Church. She was a member of United Methodist Women and faithfully attended. Ultimately, her health required admission to the Avenue Care & Rehabilitation Center curtailing her attendance on a regular basis. On Tuesday, August 7, Florinda heard the voice of our Lord and Savior Jesus Christ say "well done thy good and faithful servant." She was preceded in death by her parents, David and Amy Woolford Wongus and husband, Junior Purnell Cephas, three children: Julaine Camp, Arnold Cephas and Rodney Cephas. Siblings who preceded her were sisters Gladys Jones, Helen Pinder, Bernice Young and baby Della; brothers Emerson, Edward and Reginald Bernard Wongus. Florinda leaves to cherish her memories two daughters, Brenda Reese of Shaker Heights, Ohio, Jeannette Cephas of New York; son, DeWayne Cephas of Granada Hills, California, and daughter-in-law, Joyce Cephas of Fort Washington, Maryland; grandchildren: Kia Farlough (Marlon) of Spring, Texas, Jyreeta Camp of Peachtree, GA, Jamal Camp of Buckhead, Georgia, Ivan Cephas of Washington, D. C., Jaron Camp (Erika) of Fostoria, Ohio, Jason Cephas of Findlay, Ohio, Jeremi Camp of Columbus, Ohio, Whitney Hammer (Alan) of Toledo, Ohio, Justin Reese of Shaker Heights, Ohio, Aaron Reese of Albuquerque, New Mexico, Ryan Reese of Columbus, Ohio, Jacob and Devin Cephas of Granada Hills, California; sister-in-law, Shelby Fenwick (Jesse) of Catonsville, Maryland; brothers-in-law, Elton Cephas and Theodore Cephas of Vienna, Maryland and Weejay Cephas of New Castle, Delaware; and a host of nieces, nephews, other relatives and friends.